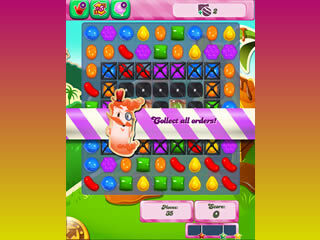 Candy Crush Saga is one the most loved and lovable smash hit games. Of course! People are addicted to sugar and candy in real life, but now it is candy and game together and you can download and play Candy Crush Saga on your device any time you want to? We love it! Great thinking, developers! There are also different power-up to enhance and make the work that you are doing more interesting. Here's a short Candy Crush Saga game review for those who happen to not be familiar at all with this game. 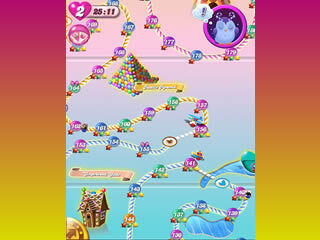 It is easy to understand how to play Candy Crush Saga - so sweet and delicious match 3 adventure. To play play Candy Crush is as easy as to play other hit mobile match-3 games: Fitz: Match 3 Puzzle and Fitz 2: Magic Match 3 Puzzle Free. Candy Crush is basicly a match-three game but with a twist. The twist is missions that really make you come up with strategies for the best results. You keep matching pieces of candy of the same color to reach a score set for you. There are sometimes special ingredients that you have to get from top to bottom. But remember that your moves are limited. If you are run out of Candy Crush lives, do not give up at once. Your facebook friends will give you a helping hand and grant you some extra lives. There are also different power-up to enhance and make the work that you are doing faster and more interesting. You can smash any kind of candy with their help or do so much more with those creative helpers if you unlock them. Though Candy Crush Saga is free, these power-ups are not. You can go on without them for a while. But you might need them further in the game for more challenging levels. The number of times you can die is limited too. But if you are able to stay within those limits, you are fine! Otherwise you have four variants what to do: simply wait for a fixed time; ask your friends for free extra lives and still wait; spend your money and buy so needed extra lives or set off on an incredible journey for free with Legend of Talisman: Match-3 Puzzle and uncover the secrets of ancient relics! Here are some other Candy Crush Saga tips and cheats: aim for four or more pieces, strategize your turns, be careful with the suggested matches, charms stay - power-ups don't.